AzBaja.com, Home of the VW Baja Bug -:- Baja Forums -:- VW Volkswagen Bug, Baja, Bus, Sandrail and Thing -:- VW Volkswagen & Baja Bug General Discussion -:- Can the adjusters be rotated? 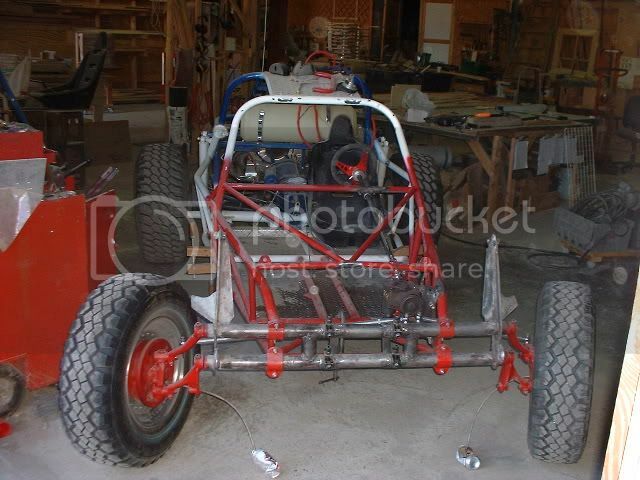 Baja Forums -:- VW Volkswagen Bug, Baja, Bus, Sandrail and Thing -:- VW Volkswagen & Baja Bug General Discussion -:- Can the adjusters be rotated? Can the adjusters be rotated? Post subject: Can the adjusters be rotated? If I was to rotate the adjuster 1/4in up (the same as just cut and turning a stock beam) would that still raise the front without changing the spring rate if the adjuster was on its lowest setting?? and if I want a stiffer spring rate than I could crank the adjuster?!?! Is this correct?? Post subject: Re: Can the adjusters be rotated? But by turning the adjuster screw as if you were raising the front would that make it for a stiffer ride?? Depends on if you have removed your stops, but the farther away from stock you go the rougher the ride can be, also remember in most cases they are 30+ year old springs, possibility of breaking is there too. I thought about the old leaf springs being too old so I was going to replace them anyways. The way I understand is that if I was to rotate the adjuster as if I was cutting and turning the stock nut and bolt assembly I would still get the height and stock ride if the adjuster was set to the lowest setting. If I wanted it to stiffen the ride I could just turn the bolt on the adjuster. Am I right on this or way off?!? You're right, but why wouold you want to make the ride even stiffer?? I am not saying i would want to. I just want to make sure that I am understanding the concept. I am going to run lift spindles. You should too. Im assuming 3" is going to be hard to get out of a ball joint (vw) any other way, besides body, but that just helps you run bigger tires (and bigger tires only give you a tiny bit of clearance... 30s and 33s are only 1.5" ground clearance different, yet alot more strain on your motor. It will provide the ability to raise as a cut and turn and also lower the front end too. Whats the maximum height the adjusters raise the front?? I am not sure exactly how much the adjusters will raise your car but I went out and measured the amount of adjustment I have on my adjusters. My adjuster are for a ball joint beam from mooreparts. I measured a grand total of 5/8th" adjustment at the adjuster. I set my adjusters all the way at the bottom of their adjustment and then welded them in the beam at the angle of a minor cut and turn....the grub screw was at approximately 4 O"CLOCK (look at where yours are sitting stock and add a bit of a cut and turn to them). From here I can crank another 5/8th" adjustment and I think that will be plenty for me. FYI I am going to run 181 spindles/arms so I have about 3" of lift right there. I will crank the adjusters to stillen the suspension when I need it for running hard off road. 1 Raise the ride height of the car. 2 Make the ride rough/stiff. You cannot use the torsion bars to raise the ride height without a stiffer ride/spring rate. If you want to keep the stock spring rate and get lift you need lift spindles. The best of both worlds is a set of lift spindles combined with adjusters so you can tune the spring rate for rough running. The height on this was a on the ground 16"
VW Volkswagen & Baja Bug General Discussion torsion adjusters? 7 speedtrash 4736 Re: torsion adjusters?